Hello and welcome to the December DeNami Design blog hop. Today's theme is RAZZLE DAZZLE! Blog hop participants will be showcasing anything dazzling--like glitter, rhinestones, sequins, shimmer paper, and more--in their DeNami creations. Don't forget, there are some super-fun DeNami prizes to be won! Two lucky commenters will be drawn at random from among the comments left along the blog hop to win a $20 DeNami Design gift certificate! You have until Monday, December 9, 2013, 11:59 pm PST, to leave comments on all the blogs to be eligible for a prize. I am SO in love with that beautifully scripted DeNami "Happy New Year" sentiment! Isn't it festive? I stamped it in metallic silver ink, and I don't think it could look more gorgeous! I used some more metallic silver ink to sponge a bit of razzle dazzle on a few white glittery chipboard numbers, and I'm completely tickled with how that turned out. I added a bit of blingy razzle-dazzly jewelry with some silver trim from Webster's Pages, and that's it! A simple little-black-dress of a New Year's card :). Well, now it's time for me to send you along on your way. Before you leave for more razzle-dazzle inspiration, be sure to leave a comment to be eligible for the randomly drawn prizes and then you can be off to see the very sweet and talented Heidi Hurley! Wow! Emily, this is the most super New Year's card. I love your sparkly, fun sentiment and that awesome jewelry. It's a winner in my book!!! Ohh Emily, this is just stunning!! Love the striking black/white combo and bit of silver bling. FUN! What a great way to use the silver bling. I'm going to try it. I love the simplicity of the layout, a real stunner! You're right-that script is beautiful and the card is like the simple elegance of the little black dress! Extremely elegant!! Love the rhinestones. Perfect for ringing in the New Year. Emily, I love the gems and silver metallic ink! Just gorgeous! And the sparkly numbers are awesome too! Wow! Way to bling up a card with that trim! Love the design...love it! I LOVE this card!!! It is just beautiful. Great use of "bling" and I can't believe I didn't see that stamp while I was doing my DeNami shopping last weekend!!! Now I'm going to have to buy MORE!!! :) Thanks for sharing with us!!! Oh my! Talk about Dazzle! I love this Emily! My goodness this is perfect for New Years! You rocked it and I adore it to bits! Have a GREAT evening Emily! Oh my, this is great. I love the idea of a New Years card. This looks like it is all dressed up and going to a New Years Eve party! KAPOW!!!! perfectly gorgeous design Emily! I love this sentiment...like you said...perfectly scripted! Perfect card for the New Year! Perfect for a New Years greeting. Oh my goodness, Emily! Creative & fabulous! This new year's card is perfect for the holiday ~ I love it. I have yet to purchase the happy new year stamp and it isn't too late to do so! I love Denami!! Excellent hop! Thanks for the inspiration. I am a follower of the Denami blog and have commented on all the participating blogs! Thanks for the giveaways!! As dazzling as the New Year's ball in time square!! Wonderfully elegant Emily! Clean and simple, yet stunning! Great card. What a classy and fun card to ring in the New Year!!! Lovin' all of that sparkle!!!! Ohhhh, Emily, this is sooooo sophisticated! A knockout for sure!!! 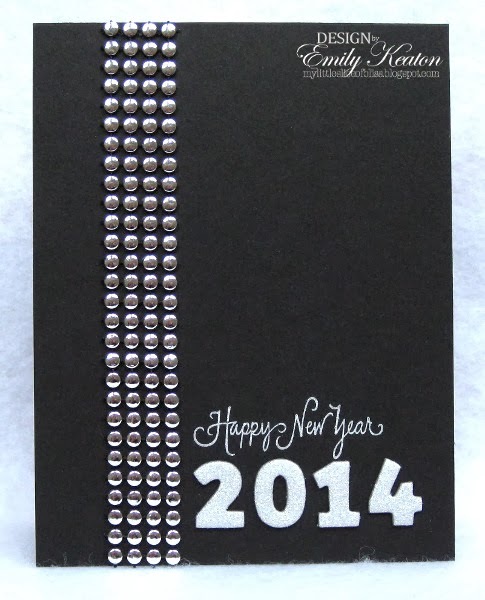 Great card - love the bling on the black background - classy. Who woulda thunk black would be such a great New Year's card!!! Super!